vCard VCF Converter for Microsoft Outlook, Office 365 iCloud, CSV and Google Contacts. Free Contacts Converter for CSV, VCF, Exchange, Outlook and Google. Import, export and transfer Contacts to CSV and VCF files, Exchange, Office 365, Outlook, Gmail and iCloud. Merge multiple contacts sources to CSV file. Import contacts from CSV to Exchange, Outlook, Gmail or iCloud. Convert all your Contacts to a CSV file and open it in Excel. Import contacts from CSV to Exchange, Outlook, Gmail or iCloud. Microsoft Outlook allows conversion to VCF (vCard) format of only one contact at a time. vCard Wizard Contacts Converter will allow you to export to one or multiple vCard files the whole Contacts folder containing an unlimited number of contacts from. vCard Wizard (former name VCard4Outlook) is a Microsoft Outlook add-in and standalone software which allows users to share, export and import VCF (vCard) files for Microsoft Outlook, Exchange, Office 365, iCloud and Google contacts. A vCard file (also known as VCF) is a standard format for electronic business cards. You can open a VCF file with Microsoft Outlook, Google, iPhone, iPad and Mac, Android, Blackberry, Windows Phone and most of other mobile devices. You can send, import or export multiple contacts and even the whole Contacts folder, including Microsoft Exchange and Public folders. If you need to transfer, export, import or move your contacts from Microsoft Outlook, Exchange, Office 365, iCloud or Google, the easiest way is to use vCard Wizard. It works like a vCard generator by taking data from your Outlook, iCloud, Google or Exchange contacts and creating VCF files. vCard Wizard Contacts Converter is an easy-to-use VCF converter integrated into Microsoft Outlook Ribbon and toolbar for easy access also available as standalone application. Using the Free version you will be able to import/export up to 5 contacts at a time. Get the Pro Edition, and you will be able to Import/export and transfer multiple contacts to and from all sources: CSV (Google and Nokia and many others), Microsoft Outlook, Exchange, Office 365, iCloud, Google, VCF (vCard). Convert all your Contacts to a CSV file and open it in Excel. Import contacts from CSV to Exchange, Office 365, Outlook, Gmail or iCloud. Merge contacts from multiple sources to CSV. Import or export Exchange/Office 365 contacts. Transfer Exchange Contacts to CSV, VCF, Outlook, Gmail and iCloud. Microsoft Outlook allows you to convert to vCard (.vcf) format just one contact at a time. Using vCard Wizard Contacts Converter you can easily convert the whole Contacts folder to one or multiple vCard files or export only selected Outlook contacts with just one click. The vCard Wizard Contacts Converter Free Version is now available. Download the Free Version here and use it as long as you need. The Free version does not have time limitations. It allows import/export up to five contacts at a time. If you wish to import/export unlimited number of contacts or save multiple contacts into one vCard file, please purchase the Pro Edition of the software. Share an unlimited amount of Outlook Contacts via email. Using vCard Wizard Contacts Converter you can share Contacts easily by sending them as attachments to an email message. Click “Send Contacts” on your Import/Export Ribbon tab, and add the contacts you wish to share (does not matter if it is only 1 contact, several contacts or the whole folder) will be attached to the email message. Share as many contacts as you need - there are no limitations. The person you share contacts with will be able to open them on a PC, smartphone, tablet or even a cell phone. Send Contacts from Microsoft Outlook to your smartphone. Move your Contacts to a mobile device. The vCard file format is compatible with Windows, iOS (iPhone, iPad, iPod and Mac), Android, Blackberry and most of other operating systems. You can open and save vCard files containing all your Outlook Contacts on your smartphone or tablet. 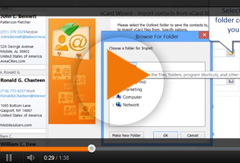 Convert your Outlook Contacts to a vcf file with vCard Wizard and send them as an attachment to email, via Bluetooth, InfraRed or instant message. Export vCard. Export Contacts from Outlook to vCard. Import vCard to Microsoft Outlook Contacts. Using vCard Wizard Contacts Converter you can import vcf files containing a single or multiple contacts in a few clicks. * Import vCard to an existing Contacts folder or create a new one. Import the vCard file format from several applications and devices. Import and Export iCloud contacts. Transfer contacts from and to multiple devices and sources: iCloud Contacts, iPhone/iPad, Mac Computers. Import and Export Google contacts. Transfer contacts from and to multiple devices and sources: Android phones, Gmail Contacts, Google Contacts. We do not store any of your contacts information. All data is processed on users' PCs and after that transferred to the users services accounts. The tool works with the latest Microsoft Outlook 2019, Outlook 2016, Outlook 2013, Outlook 2010, Outlook 2007, Outlook 2003 and 2002. Compatible with Microsoft Exchange and Public folders. Upcoming support of new sources. For the convenience of our users, the vCard Wizard team will keep on working, to add more new sources: Yahoo, Hotmail, Facebook and etc. We offer No Risk Money Back Guarantee. If you buy the program and are not satisfied, you will get your money back. Click here to learn more about the Money Back Policy for vCard Wizard Contacts Converter. *The Free version of vCard Wizard allows Import/Export up to five contacts at a time. Saving of multiple contacts into one vCard file is not available in the free version. Sync2 for Microsoft Outlook Sync Outlook between computers without a server. Synchronize Outlook using shared folder on LAN, USB drive or FTP. Sync Microsoft Outlook Calendars with Google Calendar. Sync Gmail Contacts with Outlook Contacts.